Stainless Steel Chain Conveyor utilize a powered continuous chain arrangement, carrying a series of single pendants. The chain arrangement is driven by a motor, and the material suspended on the pendants are conveyed. 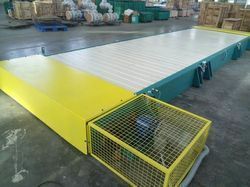 Chain conveyors are used for moving products down an assembly line and/or around a manufacturing or warehousing facility. They are primarily used to transport heavy unit loads, e.g. pallets, grid boxes, and industrial containers. 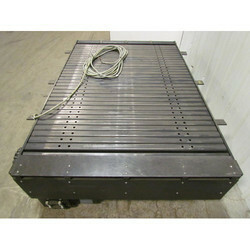 These conveyors can be single or double chain strand in configuration. The load is positioned on the chains, the friction pulls the load forward. They are generally easy to install and have very minimum for users. 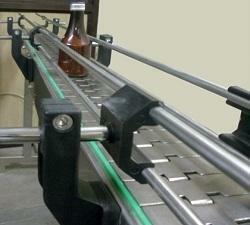 Many industry sectors use chain conveyor technology in their production lines. The automotive industry commonly use chain conveyor systems to convey car parts through paint plants. Chain conveyors also have widespread use in the white and brown goods, metal finishing and distribution industries. Chain conveyors are also used in the painting and coating industry, this allows for easier paint application. The products are attached to an above head chain conveyor, keeping products off of the floor allows for higher productivity levels. 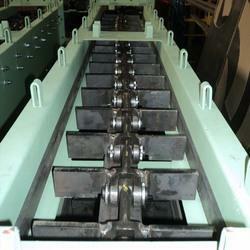 We specialize in providing a qualitative range of Mild Steel Chain Conveyor. These easy link conveyors are of huge capacity that can transport various heavy materials. Our Slat Chain Conveyor is an efficient material handling equipment that is used to carry different kinds of materials from one place to another. We offer Drag Chain Conveyor to our clients. An extensive assortment of Slat Chain Conveyor is presenting by us to our customers. The Slat Chain Conveyor is highly reliable and sturdily constructed by using high grade metal. Also, the high lead bearing capacity and high tensile strength make it right choice of the customers.